While experimenting with some new nail art embellishments, I decided to stick a few pieces of fimos on my nails and voilà, an entirely new look was born. How easy was that? My nails suddenly went from a simple gradient to a Valentine’s Day extravaganza. Really, what says Valentine’s Day more than love hearts? Later I added black strings to make the hearts look like balloons. 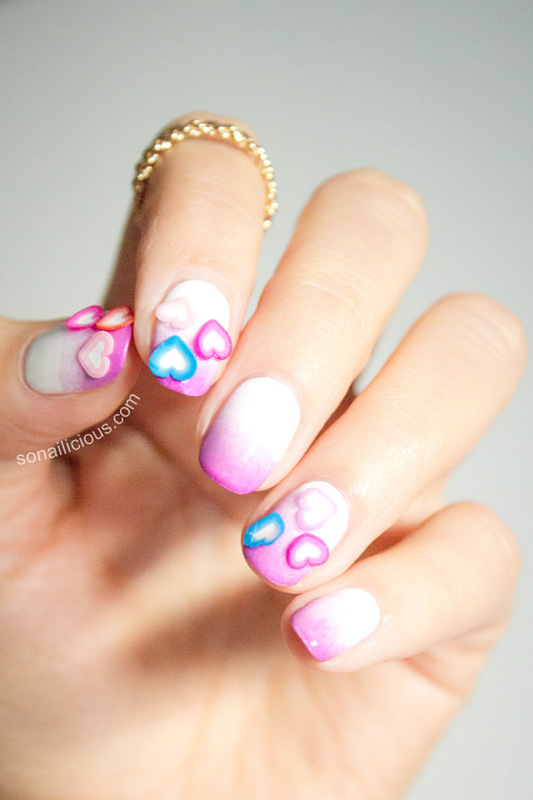 So there you go, another idea for easy Valentine’s Day nails – Love Heart balloons! 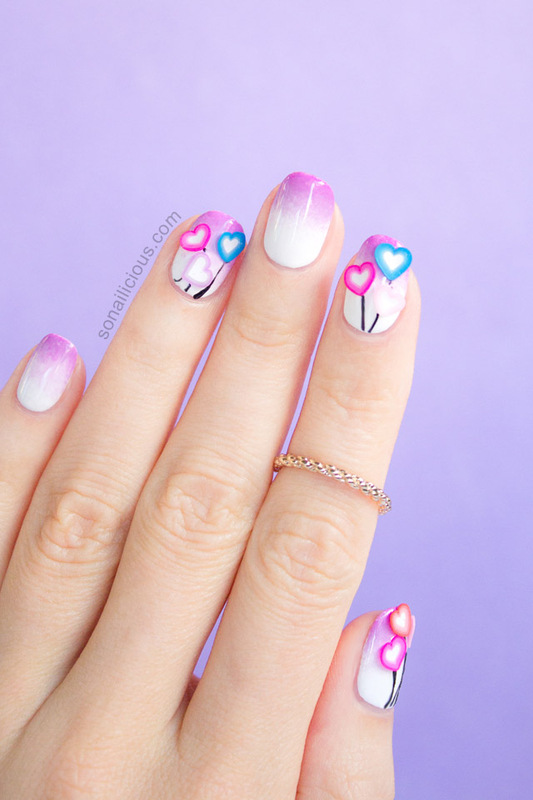 In case you’d like some guidance on gradient, or as some call them ombre nails, just follow this tutorial from our nail art book. 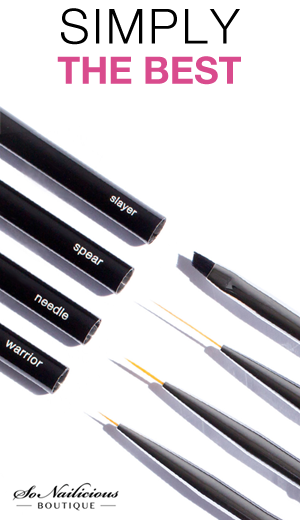 As for the fimos… the truth is that whether you’re a professional manicurist or nail art enthusiast, if you haven’t tried them, you’re missing out! In case you don’t know what it is – fimos are extra-thin 3D nail art stickers made of hard rubber. They are sold sliced (that’s what I’m using) or as a cane, so you have to slice them yourself. They are super easy and quick to use. Basically just glue them on nails and you’re done. To glue them, you can use your usual clear top coat but it’s better to use a special nail art glue to ensure a better adhesion. Anyone can wear fimos. 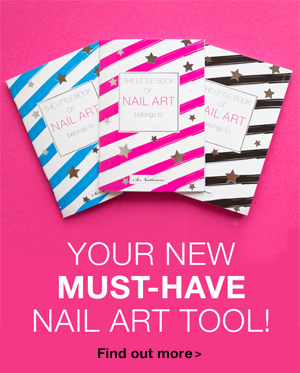 Seriously, it’s the easiest way to spice up even the plainest manicure. Just attach one or two fimos on an accent nail and it will look like you’ve done some advanced nail art. Fimos can be stylish. Forget the old school butterflies, think graphic, bold pieces. For example you can buy geometric shapes, tattoo inspired pieces or even classic love hearts. Fimos are easy to remove, unless you’re using fimos with gel but that’s the whole other topic (ie. ‘fimos + gel = endless nail art opportunities’). Fimos suit any age. You just need to find the shape that you like! Less is more. It’s best to have a plan in advance so you’ve got a good idea of what you will be doing with them. They are pretty full on, so when unsure, always go for less. 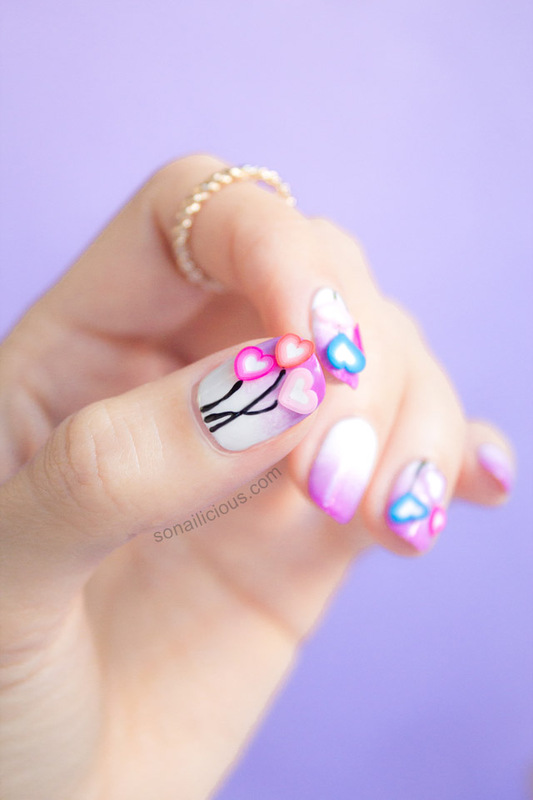 Just use a couple of pieces (or one piece) on one or two nails. 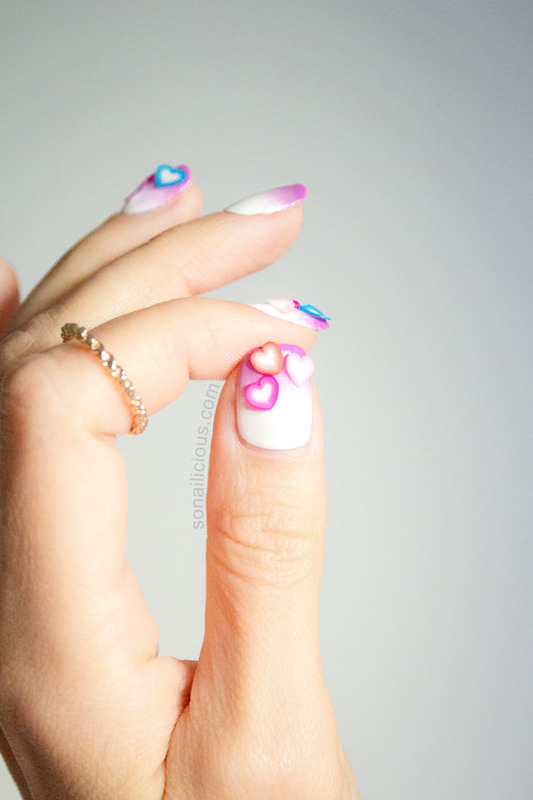 Fimos open up a whole new rage of possibilities for nail art. Personally, I’m very happy I’ve discovered these little gems. Better late than never! Used: Orly Softest White, Dance Legend Light Lilac 357 and Radiant Orchid 358, Essie Good to Go top coat and these fimos. 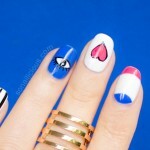 How do you like these Love Hearts Valentine’s Day Nails? Have you tried fimos before? What do you think about fimos? 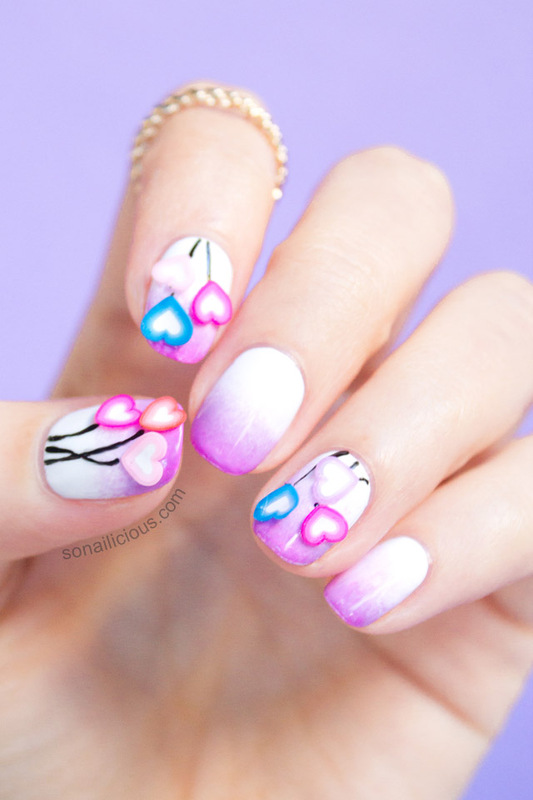 As always, whether you get inspired by this look or would like to show us your own fimo nail art, tag your photos #SoNailicious to share them with us on Twitter or Instagram. Then subscribe to our Weekly Newsletter or follow us via Bloglovin for daily updates.